For a limited time this plant is available at Hui Ku Maoli Ola in Kaneohe as well as all of the Home Depots on Oahu for about $8. Description: This plant is often referred to as 'ahinahina, hinahina or hinahina Ewa. These names primarily have to do with color; in Hawaii, many plants that are silvery have hinahina in their names. 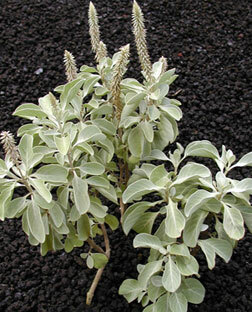 This 'ahinahina is silvery, has soft rounded leaves and can reach heights of about 6 feet. Its flowers, called spikelets, are arranged on soft spikes that protrude 6 to 14 inches above the plant. They are eye-catching and attractive in a unique way. Distribution: This plant is extremely rare and on Oahu is restricted to the coastal coral plains of Kalaeloa near Ewa -- hence the name hinahina Ewa -- and the midelevation dry forest of Makaha Valley, as well as Kaena Point. Its range was probably much larger in the past, but the habitat in which it evolved, the native lowland dry forest, has been greatly effected over the last 200 years. Today this endemic plant is recognized as an endangered species. A 14-acre restoration is in progress at Kalaeloa, involving the removal of alien plants such as koa haole and kiawe, and replacing them with the few remnant native plants still found there, one of which is this plant. Just yesterday, with the help of 17 Kamehameha school students and two teachers, we were able to plant more than 1,400 native plants, 800 of them being 'ahinahina. Landscape use and care: 'Ahinahina love full sun. Their silvery tone -- an evolutionary adaptation to living in extremely sunny and/or hot areas -- is usually derived from tiny hairs that cover the leaves to reflect intense sunlight, keeping the plant from losing moisture. When watering, it's best to soak the ground, then let it dry for a couple of days before watering again, watering less as the plant becomes established. Too much water and/or shade will result in its becoming more green and not so silvery. This can also "soften" the plant, making it more desirable to pests such as mealybugs and scales. 'Ahinahina can also be pruned or chopped back if it gets too large, but will form a naturally round shape on its own. Plant it near dark backdrops like green or red ti leaves or lava rocks to show off its silvery appearance. Also, make sure there aren't a lot of ants around, as they can bring mealybugs. If you notice them, simply cut off the affected area and control the ants using granular pesticide. Cultural use: The spikes and new leaves are used in wili and haku leis. Rick Barboza co-owns Hui Ku Maoli Ola, a native Hawaiian plant nursery. E-mail Rick.ck.barboza@gmail.com.